Passion sparkles forever . . . in the shining eyes of a true love. Because a sympathetic mill master would aid her cause, Polly becomes Alex’s guide to urban Scotland. From soccer games to pub brawls, Alex sees another side of life, and feels free for the first time to reveal the man—vital and strong—behind his intellectual exterior. Polly is utterly seduced. Their ambitions, however, remain at odds: Alex vows to earn the mill bonus to save his child, while Polly fights for the needs of her people. Is there strength enough in their sparkling passion to bind them together in their quests—and in a lasting love that conquers all? 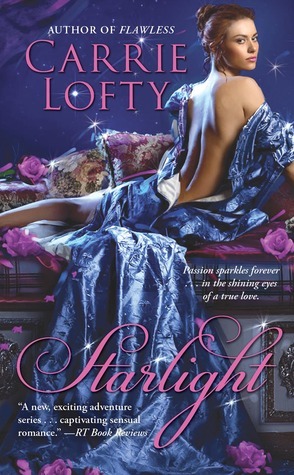 In Starlight, Carrie Lofty successfully combines all of the ingredients that I love about her romances. The atmosphere created by the gritty setting in this novel serves as an excellent backdrop, giving this romance the perfect historical touch. The characters that populate the story, both central and secondary, also make it happen, beginning with Polly who definitely belongs in the setting, and ending with Alex whose character grows by leaps and bounds right before our eyes. Alexander Christie is the late William Christie's eldest son. In his controversial will, the industrial mogul leaves Alex the Christie Textile Mills in Glasgow, Scotland with the proviso that he must manage the cotton mills and make a profit within two years in order to receive a $1M bonus, however if he fails, his inheritance will be reduced to $500. Alex is not a businessman, but an astronomy teacher at a Philadelphia university and a widower with a sickly infant son. He resents the situation and doesn't care about the money until his powerful and unbalanced father-in-law threatens to take his beloved son Edmund away, giving Alex the resolve to fight for a future and make a success of his endeavors in Glasgow, Scotland. Glasgow 1881 is a hotbed of trouble. The cotton mills masters are all powerful, uncompromising and always looking to make the biggest profit, as a result, masters don't care about poor workers' conditions. Mill masters certainly don't negotiate with workers' unions, and when crossed their wrath is often violent and deadly. Polly Gowan is a mill worker and has taken her father's place as the respected leader of the peaceful workers' union. 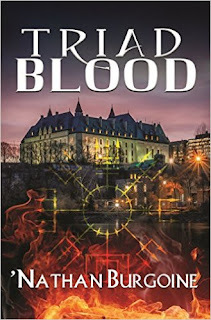 She works at Christie's Textiles where after a suspicious explosion, workers are blamed, the usual suspects rounded up by constables and goons alike, and she meets the new master Alex Christie under difficult circumstances. Reluctantly, Polly becomes Alex's guide through the troubled political situation with an eye on bringing him over to the union's side. But pretty quickly these two people from different worlds, who stand at opposite ends of this explosive situation, become passionately attracted to each other. Alex and Polly act on that attraction and begin a torrid and passionate affair that has all the hallmarks of a disaster in the making, where each keeps information from the other and trust is gained and broken on both sides. I loved Polly's character, flaws and all. The first thing you notice about Polly is that she understands her people and selflessly cares about them. She is giving, passionate and tough as nails. Initially, Polly falls in lust with Alex and is willing to take a chance on taking just a few moments for herself (having a little fun), until her feelings for him begin to complicate matters and loyalties are questioned. Her feelings reflect Alex's who also becomes torn between what he feels for Polly and what he has to do to keep his son safe from his father-in-law. Alex, I adored. Alex almost has a split personality. In Flawless, he is described as an astronomy teacher and that led me to visualize his appearance as that of a rather refined and sophisticated young man. Reading A Little More Scandal prior to reading Starlight, helped me visualize the differences in Alex's physical attributes and physicality. Lofty beautifully captures the duality to his personality and even to his physical appearance in this novel -- both Alex's rough side, the one that comes from William Christie, and the astronomy teacher or New York society gentleman. Alex is basically sexually starved after what was practically a platonic marriage to a woman he knew since childhood. He is such a beautiful man in so many ways -- passionate, tender, rough, tough, protective and even sexually naive. Alex's attraction to Polly is instant and his passion is boundless. It's interesting because Polly loves Alex's protectiveness, but simultaneously resents his propensity for playing the 'knight' who rescues ladies in distress. I understood Polly! Together, Alex and Polly are explosive, heartbreakingly tender, frustrating, and loving. Polly is really the aggressor in their sexual relationship. He is passionate but whenever he tries to be a gentleman, she is the one who repeatedly drives and pushes him to the next level in their sexual adventure. Polly is no coy miss! Alex and Polly do resolve their immediate differences as master and textile mill worker in a big climactic scene, although unfortunately there are no scenes showing how the changes affect Calton. I loved Starlight. The setting, atmosphere, characters, conflict and passionate romance all drew me and kept me reading. There's no way I will miss reading the next installment in The Christies' series. Highly recommended. Wow, Hilcia. Fantastic review. Lofty does write gorgeous prose and uses unconventional settings. I love that. Can't wait to read this one! Lori, in that case I think you might also love this one. Lofty excelled with the setting and atmosphere in this novel. Enjoy! Good news that you liked this. I'm looking forward to getting my hands on it, especially after enjoying Flawless so much. Phyl, I think you are going to like this book. The neighborhood in Glasgow, and the unrest between the cotton mills and the union really give this story that historical atmosphere that we enjoy so much! But the H/H do the rest. *g* Enjoy! La la la la la - LOL! I know what you mean. All I will say is that I loved it! And, I hope you do too... I'll keep an eye out for your review, as always. Enjoy the story! Oh, I will have to pick up this series. Really intrigued by the premise. Great review! Love the review and intrigued by your description of Alex. And does Lofty get beautiful covers or what? Leslie, Alex was a surprise! I ended up loving him. *g* And yes! My goodness... The covers for Lofty's books are ALL lush and gorgeous so far! I love all of them.